Thank You – Stokesley Coop! 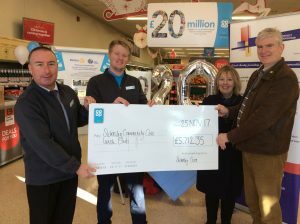 A big Thank You to Stokesley Coop for making us one of their chosen charities over the last 6 months – they raised a fantastic £5712.35 for our Lunch Club – to help us keep it running into the future. Phil receiving the cheque from Stokesley Coop. This entry was posted in News, What's On by The Stokesley CCA Team. Bookmark the permalink.